This villa was completely renovated in 2019 from top to bottom. 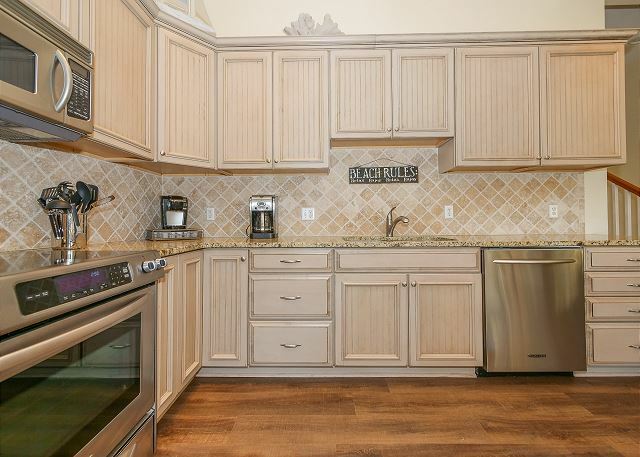 The kitchen features all new wood cabinetry, granite counters, stainless appliances and wood grain tile flooring. You enjoy a spectacular view of the courtyard, ocean and pool through the sliding doors to the balcony. The living room features all brand-new furniture, a flat screen television and stunning views of the ocean, pool and lush grounds. Relax in the comfortable, nautical-themed living room. Gather in the beautifully decorated dining room with seating for six. Cooking in this newly renovated kitchen with granite counter tops is a dream. 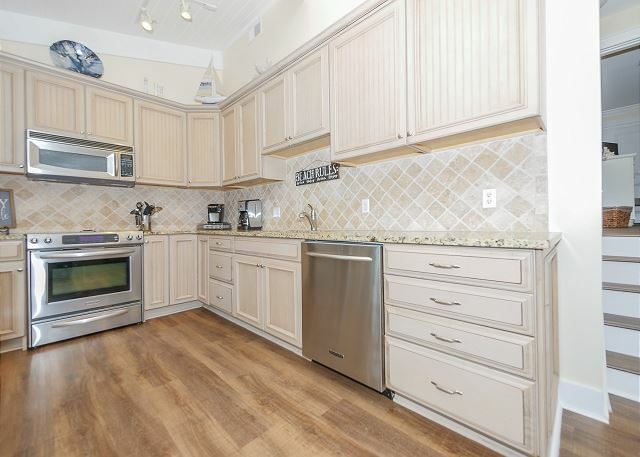 Spacious kitchen has all new stainless steel appliances and wood flooring. Natural light floods into the room in the afternoon! Enjoy the clean and bright new kitchen. The well-equipped kitchen will meet your every need. King master bedroom on the upper level features new, comfortable furnishings, a private bath with a jetted tub and a flat screen TV. USB ports on bed, extra plugs and nightlight on the end tables make this room even more comfortable! The ceiling fan will keep you sleeping soundly! Beautiful décor and plush bedding make this room so comfortable! The spacious king master bath has a gorgeous walk-in shower and jacuzzi tub for relaxing after a day at the beach or on the links. Master bath has a beautiful granite vanity and ample storage for your sundries. Spoil yourself in this large jetted bathtub! The bathroom has been totally remodeled with new plumbing, fixtures, lighting, cabinetry and flooring. Queen master bedroom on the upper level features new, comfortable furnishings, a private bath with a shower and a flat screen TV. You are sure to love this room – bright and comfortable! The renovated bathroom in the queen master suite has a walk-in shower. The ground floor of the villa features spacious family room with a queen sleeper sofa for extra company. Convenient for guests, the downstairs has an entrance to the patio, where guests can cook out. The family room also has a large flat screen TV. This separate space is a great hang-out spot for the kids! 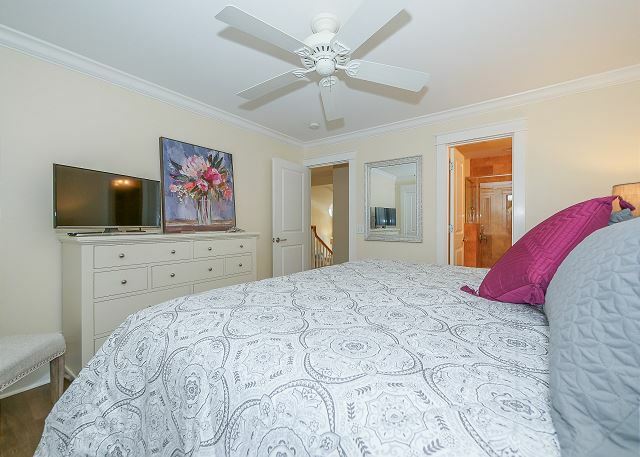 The large downstairs bedroom features a full sized bed and a twin bed – perfect for the kids. Along with plenty of storage for your belongings, there is also a flat screen TV for your enjoyment. 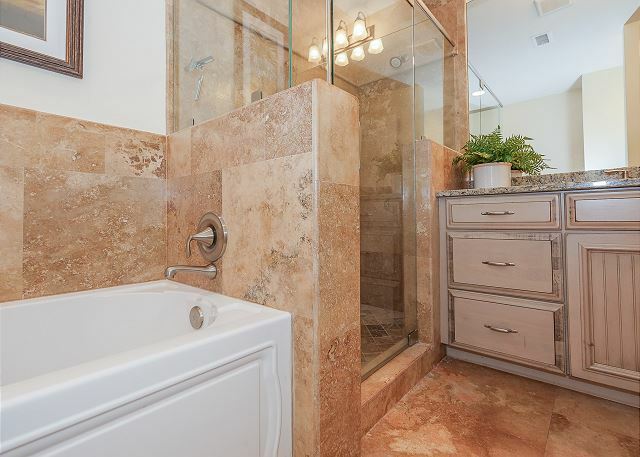 The totally remodeled entry-level bathroom has a walk-in shower and granite counter tops. Come, enjoy this morning sunrise from the balcony of Villa #19! It’s even more gorgeous in person! 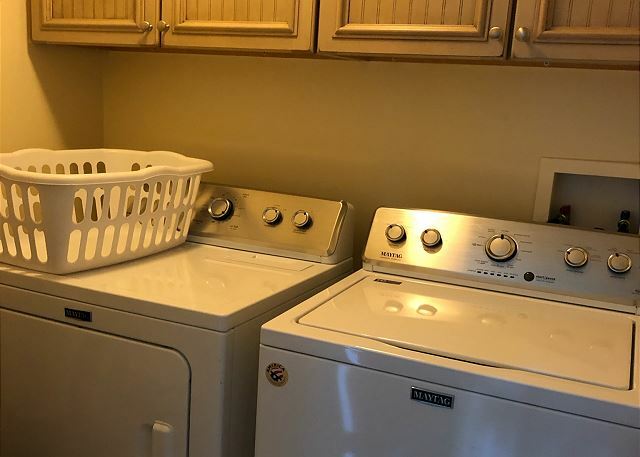 Brand new full-sized Maytag washer and dryer. Beautiful view from the mid-level balcony of the pool, grounds and ocean! Enjoy your morning coffee and gorgeous sunrise on the mid-level balcony. Quiet, serene patio outside the villa facing the ocean. The ground level patio features a dining table with seating for four or more and a built in charcoal grill. Enjoy grilling lunch or dinner on the outdoor patio. Beach Villa # 19 entrance. Private parking for 3 vehicles – no fighting for a parking spot! Welcome your home away from home! View of patio and upper level balcony from the courtyard. The front of Hilton Head Beach Villa 19 has it's own covered garage. Take a break from the beach in this cool, refreshing pool! The pool deck has plenty of lounge chair seating! Only 30 units in this complex. The well-manicured landscaping at Hilton Head Beach Villas. Just a two minute stroll from your villa to the amazing Hilton Head beach! Private walkway only for Beach Villas owners and renters. Welcome to Hilton Head Beach Villas! Let the fun and memories begin! Enjoy this gorgeous sunset steps from your villa! Take time to explore all that Hilton Head has to offer! This sunset is over the sound. 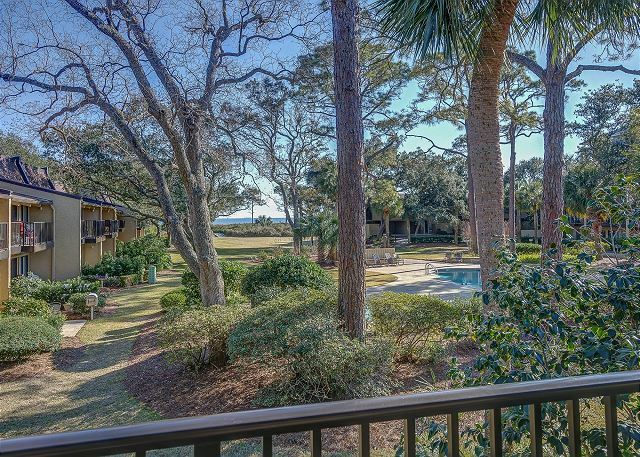 Come, enjoy and make lifelong memories at Hilton Head Beach Villa #19! 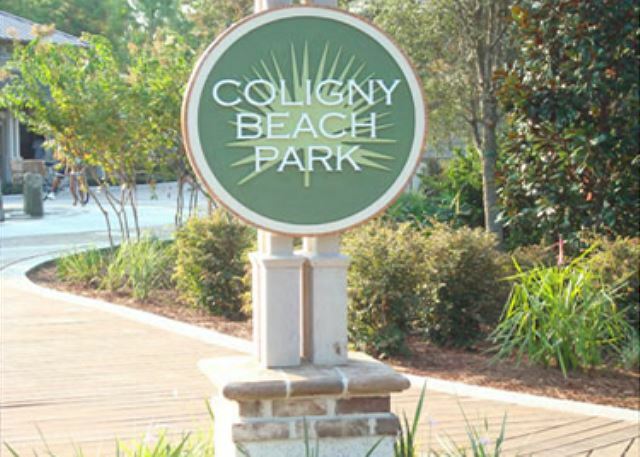 Welcome to Coligny Beach Park! Only a 1/2 mile bike ride or walk to this wonderful area teeming with shops, restaurants and a beautiful beach park. Kids of all ages enjoy the fountain at Coligny Beach Park! State of the art fitness equipment is available at the Players Club Fitness Center so you can stay on schedule with your exercise routine while away from home. Enjoy the indoor heated lap pool and jacuzzi at the Players Club Fitness Center. 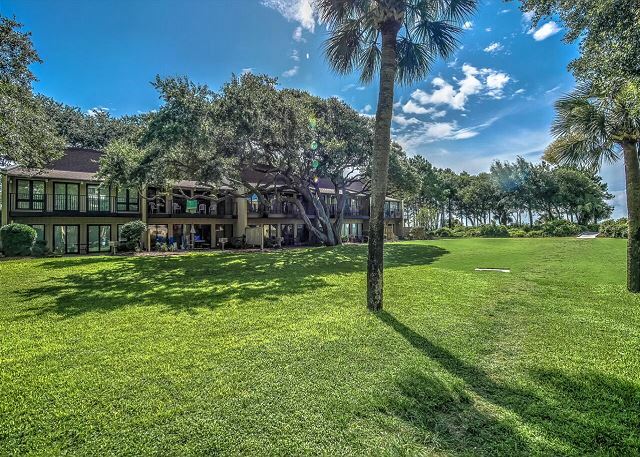 Look no further - this is the Hilton Head Beach Villa for you! New to the rental program in 2019 and sure to be your favorite! This completed renovated, ocean-view villa is light, bright, clean and ready to be enjoyed by your family. This three-level villa will comfortably sleep 7 with one king bed, one queen bed, one full bed and one twin bed. A queen sleeper sofa will accommodate overflow guests. The main living level provides a well-equipped kitchen with new cabinetry, granite counter tops, all stainless steel appliances (including dishwasher and microwave) and ample table seating for six. Floor-to-ceiling sliding glass doors on the main and ground levels flood the villa with light and showcase the amazing views to the ocean, pool and spectacular grounds of the Beach Villas complex. Two master bedrooms are located on the upper level; one bedroom features a king-size bed, the second, a queen-size bed. Both master bedrooms have a flat screen TV and a private bath with a shower. The king master bathroom also has a separate, jetted tub. The third bedroom features a a twin-size bed and full-size bed and is located on the ground level off the family room. A full bath on the entry level serves this bedroom. All three full baths have been totally remodeled with new plumbing, fixtures, lighting, cabinetry and flooring. A laundry room with a new, full-sized Maytag washer and dryer is located on entry level. The ground level family room is a second gathering spot for TV-watching or game playing. A sofa sleeper and comfortable furnishings make this a cozy spot to spend quality time with friends and family. Sliding glass doors lead to your own private patio with a table and chairs and a charcoal grill. The park-like grounds feature two pools (adult and children's) with a large sun deck and numerous chaise lounges. Another wonderful feature of this property is private, carport parking for 3 vehicles directly outside your villa and the community is gated with a private gate code. No struggling for parking and lugging your belonging and groceries in elevators! Owners provide access to 4 beach chairs, an umbrella and a rolling cooler for your use during your stay. Complimentary membership to the Players Club Fitness Center with an indoor pool is available to guests. 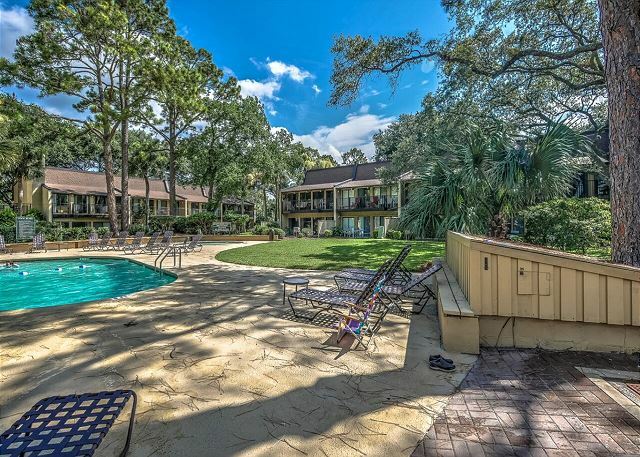 Just beyond the garden courtyard area is private access to the famous Hilton Head Island sandy beaches. The walk to the beach is less than a two minute stroll from the villa with no roads to cross! Hilton Head Beach Villas is a remarkable, beautiful and unique complex in Hilton Head and Villa #19 is a gem! 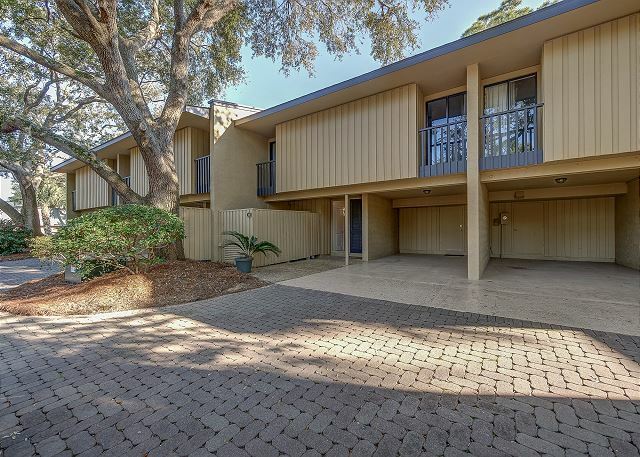 The property is within walking distance of Coligny Plaza and Beach park for shopping, dining and entertainment. With miles and miles of bike paths, world class golf, sport fishing, excellent shopping and restaurants, and the top notch beaches of Hilton Head, you’ll never want to go home! Come relax and enjoy!